This will be 25% of your annual levy funds that you declared in 2018 to 2019. This increase replaces the previous 10% allowance. You will see your new allowance at the end of April. You can transfer this allowance to one or more employers to fund apprenticeships training and assessment. Just log into your apprenticeship service account and click on Finance, and then Transfers. You will then be able to see your transfer allowance. The receiving employer can be a levy-paying employer as long as they are not sending a transfer to another employer as well. If you are sending a transfer you cannot also be in receipt of a transfer. Discuss the number of apprentices and the type of apprenticeship standards that you could fund with a transfer with the employer or employers you have selected. You both might like to read Hire an apprentice or see the Fire It Up pages for general information about employing an apprentice, and use Find apprenticeship training to search for different types and levels of apprenticeship. You’ll then be able to set up a transfer, and the employer receiving a transfer will be able to register on the apprenticeship service and start adding apprentices. As the sending employer you are responsible for managing the amount of funding that you transfer, and for funding the whole cost of the apprenticeships you are supporting up to the negotiated price within the funding band. It is likely that the apprenticeships you fund will last longer than 12 months and may start at different points in the year. The funding to pay for the apprenticeships will transfer from your apprenticeship service account each month to the receiving employer, to cover the exact training and assessment costs over the duration of the apprenticeship. You can use the estimator tool in the apprenticeship service to help you with your planning. 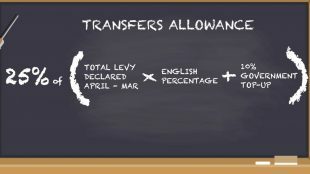 Remember if you continue to make levy declarations, you will have new transfer allowance at the start of each new financial year. You can find the funding rules here. Any employer that wants to send or receive a transfer needs to digitally sign the employer agreement on the apprenticeship service. You can view the agreement on GOV.UK as well as on the apprenticeship service. As you may need to get approval from your organisation’s legal team or legal adviser, it makes sense to start reviewing the agreement as soon as possible. Share the agreement with your receiving employer(s) so they can review the document as well. To receive a transfer, the employer who is receiving the funds will also need to have an apprenticeship service account. 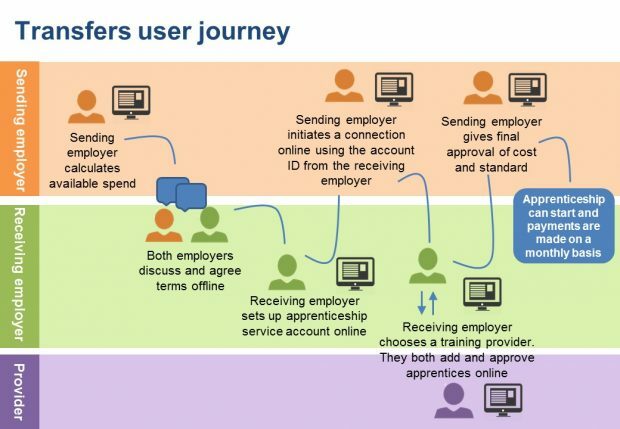 To make a transfer, the sending employer will need to make a connection with the receiving employer on the apprenticeship service. To do this, you will need the receiving employer’s account ID, which will be clearly displayed in their account. You can hear from employers who have made or received a transfers at a webinar on Thursday 18 April 2019. This webinar is intended for employers interested in transferring or receiving apprenticeship service funds. We will be providing an overview of how to set up a transfer and you will hear directly from employers that have already funded or received an apprenticeship service transfer. To have the opportunity to ask questions, join us on Thursday 18th April, at 12:30 to 1:15pm, or 2pm to 2:45pm.